Marilyn Kraner is Manager Individual & Family Services at Jewish Care and Melinda Kidgell is Program Manager, Client Services at Jewish Care. Homelessness – What About the Jewish Community? 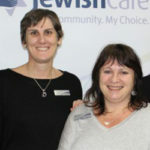 Melinda Kidgell and Marilyn Kraner, Tuesday, 24th November 2015 - There’s been a significant increase in demand for support by members of the Jewish community who are experiencing the same range of issues that cause homelessness in the general community, writes Melinda Kidgell and Marilyn Kraner from Jewish Care.